I've been thinking about my former students lately. Anyone who has ever spent time with young people over the past ten years would see something inevitable in the current moment over gun control in the United States, where Parkland students are charging at the seeming edifice of the NRA — and leaving cracks. The moments I remember most from teaching in the western suburbs were when I was the one getting schooled. Nothing snaps you out of being a grownup more than being put in your place by a kid (gently, if you're lucky). "It is an indictment on our failures as adults, especially those in power, to privilege the perspective of young people, to engage with them as citizens and full persons, with a high stake in how societies and economies function." In developmental terms, they are far from a state of learned helplessness. Some of the dominant literary themes of their childhood involve teenagers banding together against authoritarian figures, such as the Harry Potter series and The Hunger Games. It is easy to default to awe and admiration, or even relief that perhaps the next generations might yet save us. It certainly seems wise to not get in their way. But it is in some sense an indictment on our failures as adults, especially those in power, to privilege the perspective of young people, to engage with them as citizens and full persons, with an even higher stake in how societies and economies function. Politically correct role play??? No wonder Australian children have progressively fallen further behind the rest of the world in academic achievement over recent years! As an experienced activist for the past half century! I am so excited and hopeful seeing the teenagers in the US taking the lead in this crazy reality they live in where assault weapons can be acquired so easily. The craziness extends to the President who stated yesterday that crazy people should not be allowed to own weapons capable of killing lots of people at one time. The irony of this of course is that the President has his finger on the nuclear button! Irony aside what you say about changing awareness of our young gives me hope too that as Australia's ethnic diversity continues perhaps the fear of invasion from the north will subside. Ultimately this fear is what allows our governments to stay in the pocket of the US military industrial complex, the insurance policy based on fear of invasion where there is no evidence for this to happen. A nice article Fatima, but I would have to agree with John F that it reflects the left-green bias of the public school and university teaching professions, that seems to be impressed upon unsuspecting young people in Australia; and it has to be said against their real objective interests. One day they will wake up to the realisation that an over-expensive and distorted education system dominated by the interests of their teachers (and their union) has sub-optimally prepared them by competitive international standards. Further, that the things they should be getting excited about include an increasingly huge national debt that they will have to pay off, and that they will be much poorer than they need to have been, and in worse jobs. All mainly, because of the polarised, ideological and negative politics (tax, energy, productivity, international investment policies for starters) that have been imposed on their country by inner city elites heavily represented by such as those very same tax-payer funded teachers. "Politically correct" is the epithet to throw at anybody who doesn't confine their commentary to the staid linear-thinking of the first three quarters of the twentieth century. By 1976, we as a nation had recognised our indigenous compatriots as Australians; we had scrapped the While Australia policy; we had begun to return confiscated country to indigenous communities in the Northern Territory, and we were welcoming Southeast Asian refugees, whether they came by boat or plane, with papers or without. Many of us were supporting, albeit at a distance, the movement for civil rights for African Americans, along with the parallel campaigns for civil rights for Indigenous Australians ... our major unfinished business. Many Australians were on the Darwin to London land-road, many content to stay in Southeast Asia or India, to broaden their cultural experience rather than rushing to (no longer Mother) England. Meanwhile in our post-Vatican II church, we were getting on with trying to live the dream despite worrying signs of recalcitrance in Rome. Thank you Fatima for your reminiscence of teaching young Australians who happened to represent much of our culturally diverse nation. While your brief essays in Eureka Street elaborate much of the outlook of my children's generation, they help maintain the optimism of my own. Ian F. "Political correctness" I think means conforming to a particular political or philosophical viewpoint or trend because of pressure from the promoters of that viewpoint or trend. It is predicated on fear of criticism, exclusion or of upsetting the promoters. It is a form of falling in with the mob as a follower rather than as a leader and thus unlikely to achieve much of value. It prevents legitimate criticism and often ignores truth and fact in favour of the political or philosophical viewpoint. Now, there's some genuine "political incorrectness"!!! Because something has been called a certain name by society it doesn't mean it is correct. If leaders in these societies suggest it is more appropriate to call something by a more accurate name it doesn't mean it is ideologically wrong or to be dismissed. Critical Thinking comes about when people have the opportunity to consider a range of perspectives in a relatively safe environment which has been indicated in the article. It has always been difficult for those with 'fixed' or 'single minded' views to accept there are other 'realities' other than their own. Thanks for sharing Fatima, social justice does matter. “Political correctness” is usually thrown into a debate when someone opposes something but does not have a good reason for their opposition. It is becoming meaningless. Good on Fatima’s students for speaking out and good on her for writing about it. The issues were there in earlier years. In my high school days in the 1960s we protested about our involvement in Vietnam. It wasn’t easy to protest in a school environment in those days but some teachers were more encouraging of a sometimes-heated exchange of ideas. We had a teacher in 1971 (a Wallaby at the time) who was prominent in the anti-Apartheid movement in Australia and who worked against the Springbok tour of that year. Again we were encouraged to talk and think about it. It was the beginning of the Green Bans in Sydney and again there were arguments and protests and I have to say all these years later Sydney is better because of those bans. Were we useful idiots to a wider cause? Quite possibly, but that isn’t the point. Some of us may have been used in some cases but we listened and argued and I don’t think we were wrong. 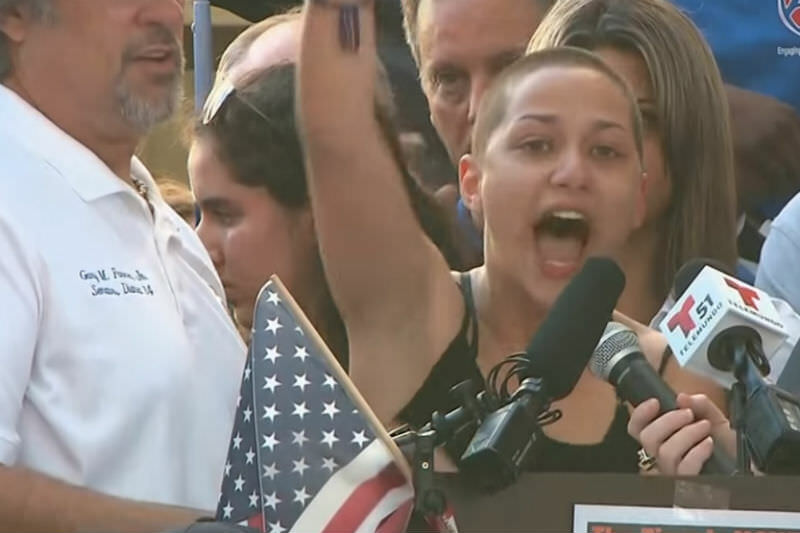 I am so impressed with the calm determination and willingness of the Florida students to confront the “vested interests” (if I can throw in another cliché) and make their points so clearly about what is wrong. It is encouraging and I share Ian Fraser’s optimism. Brett: " “Political correctness” is usually thrown into a debate when someone opposes something but does not have a good reason for their opposition. It is becoming meaningless.” Political correctness is the intellectual (and often legal) tyranny of demonising people who have ideas different from yours for no other reason than your irritation that they have ideas different from yours. As for “not have a good reason”, see the YouTubes of Canadian iconoclast Professor Jordan Peterson, now on a speaking tour here, explaining the ‘speech codes’ legally imposed by soft totalitarianism in a sibling Westminster state. I’ll stick with my interpretation Roy. It comes from experience. For example, a few years ago my church discussed acknowledging the ongoing Indigenous heritage in our local community. It was not token symbolism, nor was it confrontational, just something a bit different. The idea didn’t go forward, not because of a rational argument against it, but because of a nebulous “it’s just political correctness” line. No argument, just a cliché that worked. If there is any intellectual tyranny it is usually in the extension “political correctness gone mad”, thrown into discussions to try to end the debate. There’s your soft totalitarianism for you. Isn't it interesting how quickly the discussion has departed completely from Fatima's central point. Once again the conversation becomes polarised, with only two mutually exclusive viewpoints. Personally, I'm not interested in whether Fatima's role play was 'politically correct', whatever that may mean. As a former teacher myself, I recognize a perfectly legitimate consciousness- raising activity which accompanies, without replacing, the more formal and rational processes of learning and understanding. It's not either/or. In any case, it's evident that this kind of education has had results which aren't just about the ability to spell, count and think rationally, essential as those skills are. Kids today are leading us in involvement and responsibility for our own society. Is that good, or not?